An Apple patent application for a "Keyless keyboard" suggests the company may be considering a major change to its peripherals and MacBook hardware, by effectively using a touchscreen to create a keyboard with more versatility than a physical version can ever provide. The application filing for "Keyless keyboard with force sensing and haptic feedback" was filed with the U.S. Patent and Trademark Office on August 31 last year, and was published on March 15. The filing effectively describes replacing the physical keys of a keyboard with a glass display equipped with multiple touch sensing systems. The application claims traditional key-based inputs "lack the flexibility to accommodate expansive features offered by newer devices, operating systems, and software," and are "unable to adapt to different user needs and preferences." While touchscreen inputs have the potential for offering alternative inputs to the user, the "flat, inflexible input surface" provides little or no tactile feedback to the user. Apple's proposal consists of a top glass layer that includes two force sensing systems for different "input regions," as well as a touch sensing system for determining the location of the user's fingers. Haptic feedback is provided by one or more actuators, to provide a response for each key "press." 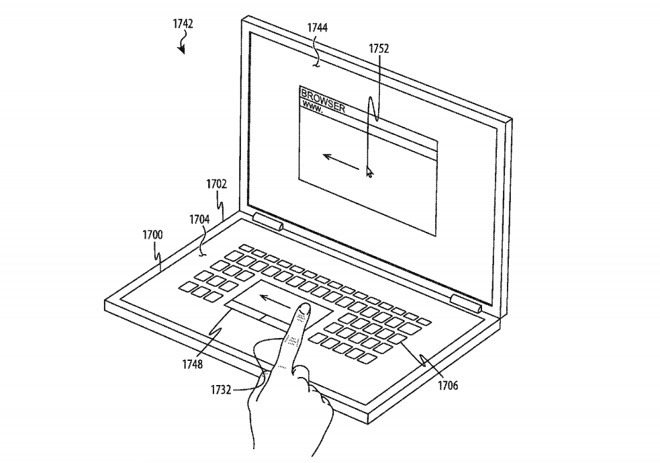 Images supplied in the filing depict a keyboard peripheral that uses a long touch panel where the key images appear. There is also a depiction of a notebook that seems to have the entire lower section, typically reserved for the keyboard and the trackpad, replaced by a single large panel. In both cases, the keyless keyboard changes what is shown depending on the user's need. This can include showing a trackpad area in the middle of the keyboard, and rearranging the layout to one that is more ergonomic for the user's hand positioning. As a byproduct, the use of a software-defined keyboard layout opens up the possibility of simplifying localization of Apple's hardware, as the same keyboard could be used for any language. The flexibility could also allow for unique inputs for specific apps that are not keyboard related, such as sliders or other types of controls. Apple has looked into alternative ways for its customers to use future MacBooks without using a physical keyboard. In February it received a patent for "Dual display equipment with enhanced visibility and suppressed reflections," where the second screen is used as a dynamic keyboard. The concept is also not limited to dual-display devices, as another patent application was discovered in October 2017 detailing "Electronic Devices with Displays" that could be folded in half. A flexible portion in the middle of the display would allow it to fold, effectively allowing an iPad-style device to be shaped similar to a notebook, with the software keyboard residing on one of the two flat sections. Apple is known for filing large numbers of patent applications for potential products, many of which do not end up being used in consumer products. While it is possible Apple could implement such a keyless keyboard system in a future product, it remains too early to tell if it will happen.